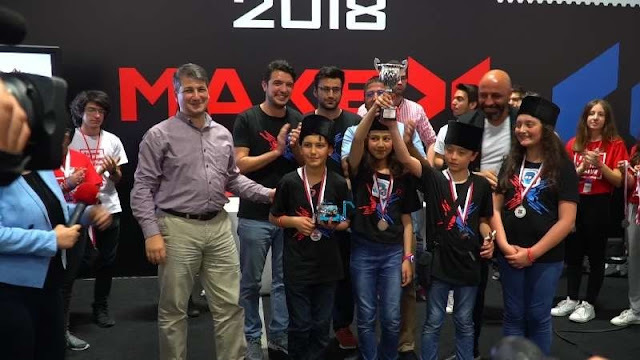 Today, the MakeX Robotics Competition Committee announced that the 2018 MakeX Robotics Competition season starts officially, and its first international competition enclosed with success in Turkey. Makeblock is the exclusive equipment supplier of MakeX providing full sponsorship and support. May 19-20, The first 2018 MakeX International round concluded successfully in the convention center of Istanbul, Turkey. Over 200 middle and primary school students from 7 cities battled here, 4 teams in total will enter 2018 MakeX Final. The Kodla Ardahan team capped the title as a middle school winner while the Robust Jr.team the primary school winner. Representative student of the winner teams said: "We are very thrilled for winning and proud to be a part of this event. Our next step is to attend the big MakeX Final in China representing our country as it deserves a place in the international arena." Co-founder of Robotistan Yusuf GUNGOGDU said: "More than 30,000 kids today learn how to code in Turkey. With the ever-increasing support of government and coding events, competitions like MakeX unfolding, we are thrilled at the prospect that STEAM education in Turkey will continue to thrive." MakeX Robotics Competition is hosted by the MakeXRobotics Competition Committee. It is an international robotics competition targeting 6 –19 years old teenagers. Since its launch in 2017, over 10 MakeX events have taken place with over 5,000 teenagers forming 1,000 teams participated. MakeX aims to become the most influential high-level robotics competition, help bridge the gap between STEAM education and its evaluation. Through the technology-integrated Makeblock platform, MakeX makes STEAM education accessible to more teenagers. This year, MakeX Robotics Competition officially goes global, and will host international rounds in countries like Turkey, France, Estonia, New Zealand, Singapore, Indonesia and China. MakeX is working with renowned strategic partners like World Robot Conference, Robotex and RoboRAVE, and will conduct regional/city rounds throughout the season. Eventually, 350 teams will be selected to compete in China for the MakeX Global Final. Trophies and a series of prizes totaling 500,000 RMB will be awarded to the winners of the year. MakeX 2018 is now open to teams who are interested in competing at MakeX 2018, please email info@makex.cc to submit your requests. To learn more about MakeX, follow MakeX on Twitter: @MakeX0513 or Facebook: @MakeX0513. MakeX is a global robotics competition platform for teenagers all over the world, with the aim of pushing for innovations in education. It empowers teenagers by offering fun and challenging competitions to engage them in science, technology, engineering, art and mathematics while improving their creativity, practical ability, communication skills and teamwork spirit.